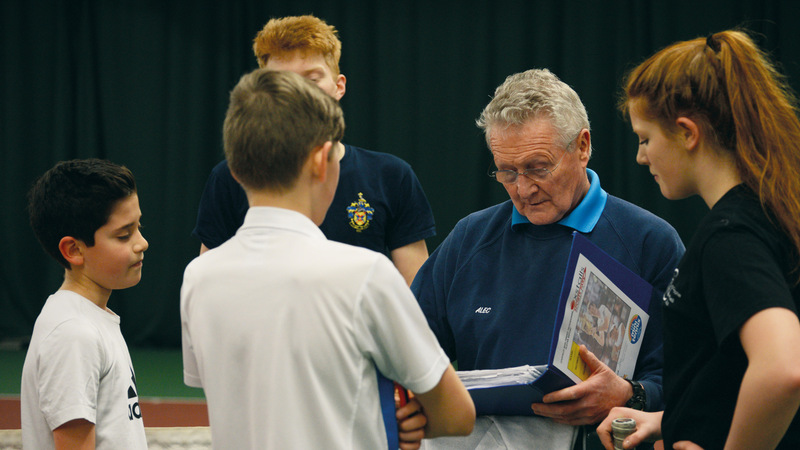 Whatever your age or your ability, we can help you improve your tennis skills with our Tennis Coaching. We offer both group and individual lessons and these are run in a fun, social and relaxing environment. All downloadable leaflets and brochures correct at time of printing but sessions may be subject to scheduling changes, please call the Sports Park reception on 01452 396969 before attending. Our coaches are all fully qualified, LTA licensed or registered, as well as being first aid trained and DBS checked – so you can be confident in our team. It’s never too early to start! 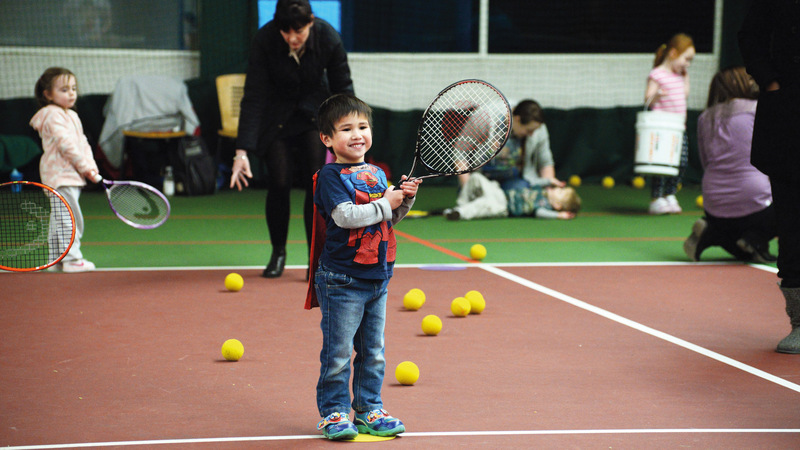 With our tots tennis your little ones can start learning tennis from 2 and a half years old, taking part in drop in sessions or courses. These sessions focus on fun, games and core skills – in fact it’s so much fun, we also encourage the adults to join in too! (All equipment is provided but if you’d like to bring your own, we recommend sponge balls and 19 inch rackets). 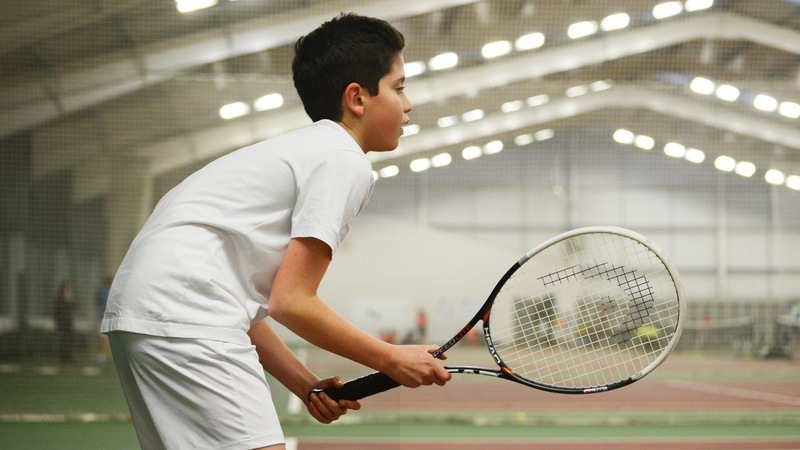 At Oxstalls, we run a huge LTA tennis programme for players between 5 - 18 years. This is a continuous programme that runs 48 weeks a year. In the sessions, your children will learn the basics to the game, with the goal being for every player to be able to serve, rally and score. This means that your children will enjoy the game whatever their level or ambition. There are two groups within the Mini Reds – one for 5 - 6 years and one for 7 - 8 years. These groups still play with sponge balls and 21-23 inch rackets are recommended. Once they have progressed from the Tots sessions, your child will then join the 5 - 6 year old mini reds where they will take part in different tennis stations – ranging from rallying, serving and volleying as well as core skills. Our 7 - 8 year olds work on different themes each week and will practice drills, partner work, games, points as well as their core skills. Mini Orange The next level is for 9 years olds who make the transition from the smaller court to the larger mini orange court. They also progress with the equipment, playing with orange tennis balls and 23-25 inch rackets. Mini Green This group is for the 10 year olds who now play on the full court. The sessions are focused on technique and competition whilst remaining fun! The equipment progresses to mini green balls and 25-27 inch rackets. 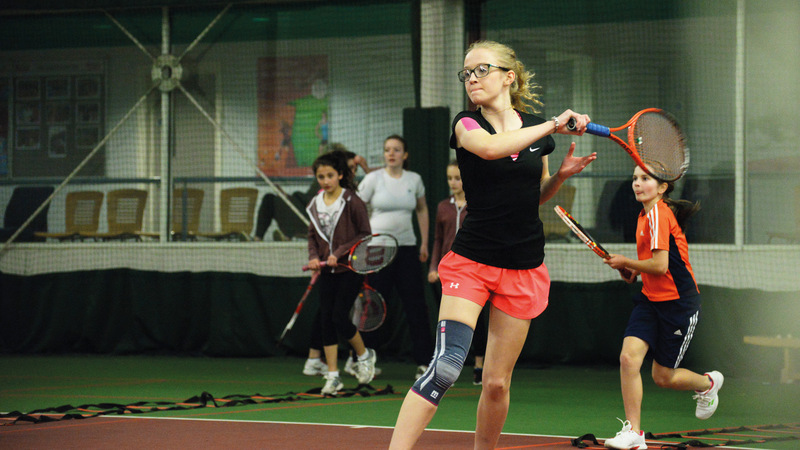 Our Junior Tennis programme runs for 48 weeks. 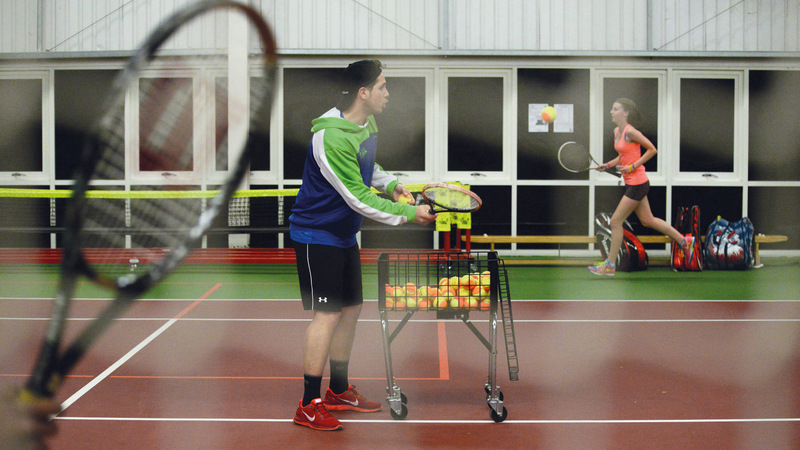 Players change surface every 6 weeks playing inside on the acrylic courts and outside on the artificial clay. This makes sure that each player is well rounded and able to problem solve when playing in all conditions. Players begin at JUNIOR YELLOW 5 and progress to JUNIOR YELLOW 1 where our most experienced Juniors train. 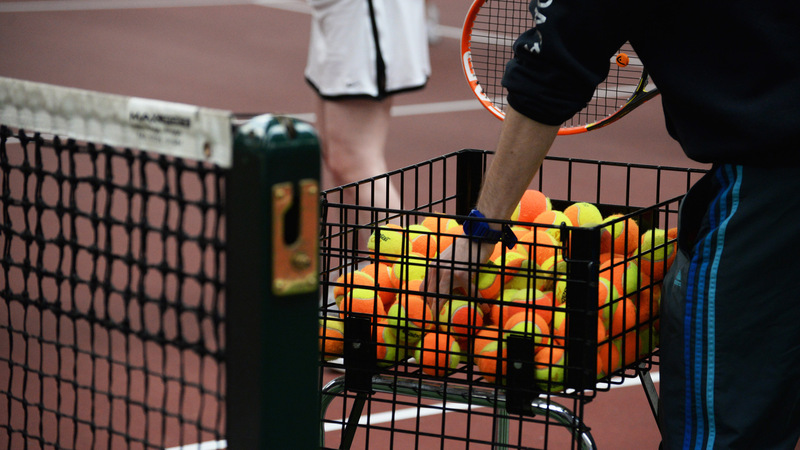 A great way to meet like minded players is to take part in our Adult Tennis lessons. You’ll get to work on improving technique and learn about singles and doubles tactics as well as meeting a new group of people. 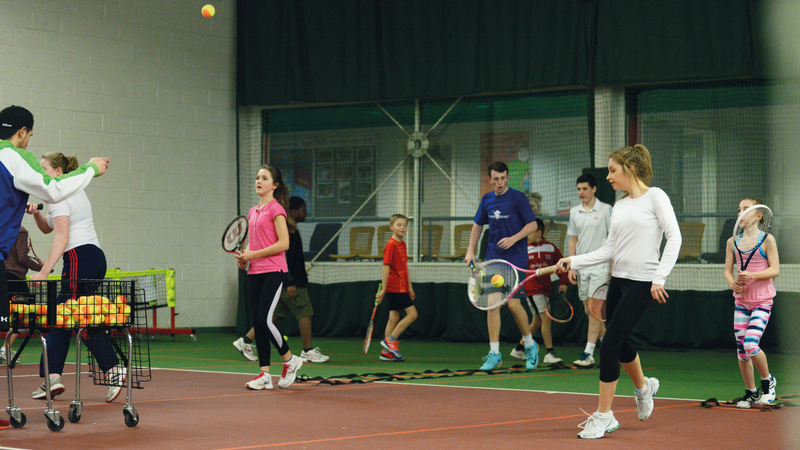 In fact, a lot of our regulars meet outside our lessons to play more tennis and socialise. We offer three levels - beginners, improvers and developers. If you are not sure which level you would fit into, please come along to a free taster lesson where one of our coaches will be able to say which group would be best for your ability. We’re incredibly proud of our Tennisability programme which offers adult and junior wheelchair tennis, adult and junior learning disabilities, Down’s Syndrome and Alzheimer groups. 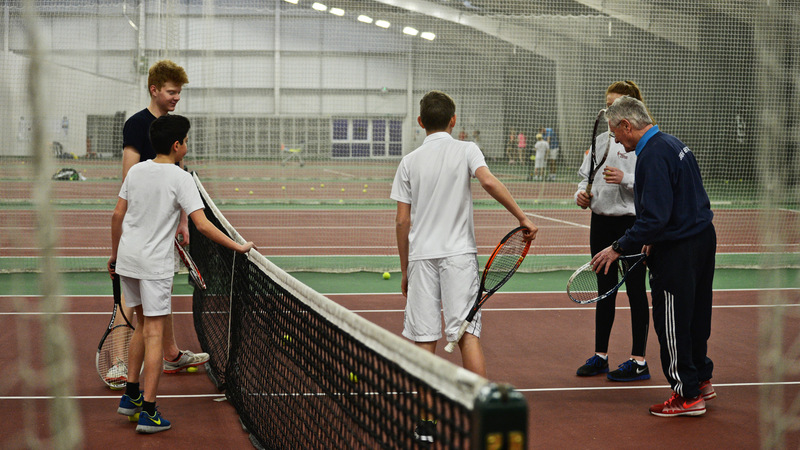 All of our sessions are run by our specialist disability tennis coaches and we work closely with the Tennis Foundation to make sure that we deliver safe and inclusive tennis sessions. In fact, they have recognised us as a Disability Tennis Network. All equipment is supplied, including tennis specific sports chairs. For our most talented players, there is the Oxstalls Academy which is by invitation only. The Academy is for those players who work hard, train hard and compete on a regular basis. As part of the Academy, there is the opportunity to access specialist strength and conditioning from our Head Strength & Conditioning Coach. Our Academy coaches are all LTA performance qualified. The Academy runs 42 weeks each year to allow players to travel and compete. The Academy is not limited to members of Oxstalls – we are happy for players from other clubs to access our programme. 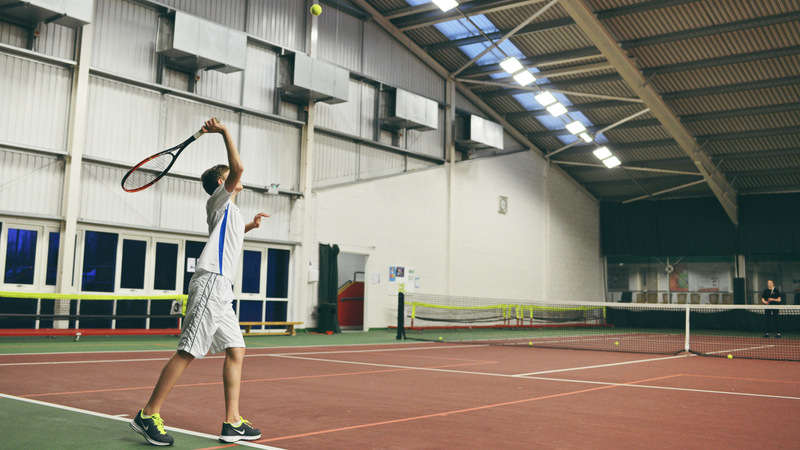 Tennis lessons are now part of the Active Life Junior Membership – An all-inclusive membership that gives access to your weekly lesson but also provides the added value of free public swimming at GL1, Drop in sports sessions, off peak court hire, Fun factory, Toddler World and much more. Memberships start from as little as £24.50 per month, depending on the age and ability.